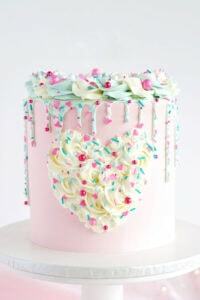 This Pink Champagne Cake Recipe is the perfect addition for your Valentine’s Day party! This cake recipe is bursting with pink champagne bubbles, strawberries, and a delicious Meringue Buttercream Frosting. All of your friends will be asking you for this amazing champagne cake recipe for their next girls’ night! Switch to the paddle attachment and add champagne, sour cream, vegetable oil, vanilla, and eggs. Mix on low-medium speed just until combined but do not overmix. You can add the pink food dye at this time if you wish. In a heat proof mixing bowl, add sugar, egg whites and salt. Whisk together until combined. Add a small amount of water to a saucepan and cook on stove on medium heat until boiling, then reduce heat to a simmer. Place heat proof bowl with your sugar/egg/salt mixture over the saucepan with the stove still on, to create a double boiler. Be sure the water in the saucepan is not touching the bottom of your bowl. Whisk continuously while the egg mixture is heated over the simmering water; be careful not to overheat this, we don’t want scrambled eggs! It is done when the mixture is warm or hot to the touch, and the granulated sugar has melted and is not grainy when the mixture is rubbed between your fingers. You can use a candy thermometer to ensure the temperature has reached 140° F.
Remove bowl from heat and place in your stand mixer. Using the whisk attachment, begin whisking the mixture on low speed, and gradually increase the speed to high (this may take several minutes as the mixture begins as a hot liquid, then slowly becomes a meringue). Continue mixing on high until your meringue is glossy and stiff peaks have formed. This will take significantly longer if using liquid egg whites from a carton. Reduce the mixer speed to low, and add in the cubed butter, one or two pieces at a time until fully incorporated. The butter will mix into the meringue and at some point, it will look curdled – do not panic! Keep mixing and increase mixer speed if needed. It will all come together smoothly. Replace the whisk attachment with the paddle attachment and add vanilla extract. Beat on medium speed until smooth, to remove any air bubbles. Storage: if not using immediately, store in airtight container in the refrigerator. When ready to use again, let sit out at room temperature until softened. Once softened, you can put it in your mixer and beat with paddle attachment to remove any air bubbles.